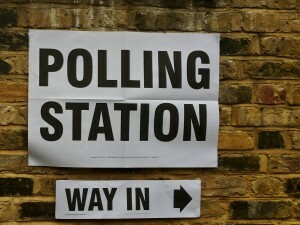 Survation (for the political team at The Daily Mirror) was the only polling company to conduct a poll specifically of local election voting intentions in 2012, polling 1019 people over 23rd-27th April (concluding 6 days before polling day). The results predicted a Labour gain of 800-1000 seats (900 at the mid-point) – more than the 700 being discussed at the time as the benchmark for a significant Labour victory and considerably higher than many Labour politicians were openly anticipating. However, our prediction was very much in line with the actual result – a gain of 823 seats across the UK. 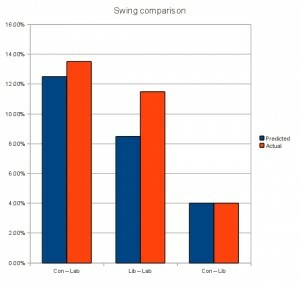 The chart opposite shows how the predicted swings tallied up, with our predictions for the Con-Lab and Con-Lib swings being very close or spot on. The only discrepancy was an underestimate of the swing from the Liberal Democrats to Labour, which we predicted at 8.5% but actually came out at 11.5%, meaning the losses were much more evenly divided between the coalition partners than expected, but still with more of the burden borne by the Conservative Party. The only other formal seat prediction published for the local elections was the annual Rallings & Thrasher prediction derived from local by election results, published on 18th April. Their predicted a slightly smaller swing to Labour with only around 700 seat gains, but this is not surprising given that the data they were using was too early to include the increasing national swing towards Labour throughout April.